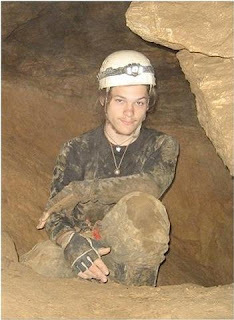 Hood College student Corey Hackley has discovered too many caves to count. Hackley, who works at Crystal Grottoes Caverns in Boonsboro as a guide surveyor and handyman, spends most of his time either in or looking for caves. "The thing I like about caves is that they are one of the few places on Earth yet to be discovered," he said. Caves "are the only spaces that escape social contrivances," he said. "Finding new caves is a way to embody ... what is beyond human activity." Hackley, 19, said there are two kinds of caving: recreational caving and project caving. "Recreational caving is what you do for fun," Hackley said. "Project trips are grueling, but worth it." Project caving involves surveying uncharted caves by recording their distance, direction and angles of slope. These underground expeditions usually last two to three days. "Finding a new cave is indescribable," Hackley said, before clarifying. "Nine times out of 10, the (newly discovered cave) will be 40 to 50 feet long, miserable, and no one will ever want to go there again." It's the possibility of finding a more significant cave that keeps Hackley searching. "When you do find something wonderful, it's a very special experience," he said. "It changes you." Searching for undiscovered caves can also include above-ground exploration. With the use of topographic maps and a knowledge of where caves are likely to be found, such as in limestone, where streams disappear or where there are folds or faults in the rock, it is possible to find new cave openings. Finding new openings involves a lot of digging. "Sometimes I dig 40 to 50 feet operating on a theory," Hackley said. Often, those efforts go unrewarded. "I spend most of my life digging holes that lead to nowhere," he said. Hackley's passion for caving developed at a young age. "My dad was a caver, and when I was a little kid I remember my dad coming home covered in mud," he said. Hackley's parents began taking him to commercial caves when he was just a baby, and Hackley began exploring noncommercial caves when he was 5 or 6 years old. For those new to caving who would like to learn more about it, Hackley suggests attending a local grotto (chapter) of the Speleological Society. "You need to get a sound education (on caving) before you proceed," Hackley said. Caves are delicate environments and can be easily damaged without the proper knowledge. "A novice caver could walk through a pool of stagnant water and not think anything about it, but there could be life-forms in there that are only found in that cave," he said. Basic caving equipment includes a helmet, a headlamp, gloves, sturdy boots, old clothes, a first aid kit and a compass. Three light sources and replacement batteries for them are also highly recommended. To be safe, cavers should travel in groups of three or more, he said. That way, "If you get hurt, one person could stay with you while the third person went for help," Hackley said. It is also important to be able to distinguish between perceived threats and real threats when caving. "Most dangers in caves are psychological," Hackley said. "When you panic, things go bad." When in a dangerous situation, Hackley said to think your way out of it as quickly as possible and then try and figure out what went wrong. Once, while caving, Hackley found himself buried up to his waist in fallen rocks. "It was horrifying," he said, but he kept calm and was able to extract himself. Ultimately, when caving, Hackley advised, "be prudent, be prepared and accept some degree of danger." Like many cavers, Hackley dreams of finding a cave system with miles and miles of passages. "You're walking, you lift a rock and find an entrance to a cave, and spend the rest of your life mapping and exploring it," he said.